I can only remember one Halloween costume my mom bought for me growing up. I think I was in third grade and wanted to be a mermaid – she bought the prefab fish tail and skimpy bikini top as a set (I wore a pink leotard underneath to make it child-appropriate and to protect me from the Midwest October chill). But generally mom my helped us “make” our Halloween costumes. This does not mean that she was a crafty person. When I was an Indian in my 6th grade production of Peter Pan my mom was furiously hand-stitching my costume the night before dress rehearsal since we didn’t have a sewing machine. But she was inventive. The picture below was taken around age 3 I think (maybe 4?). I was a fairy princess . 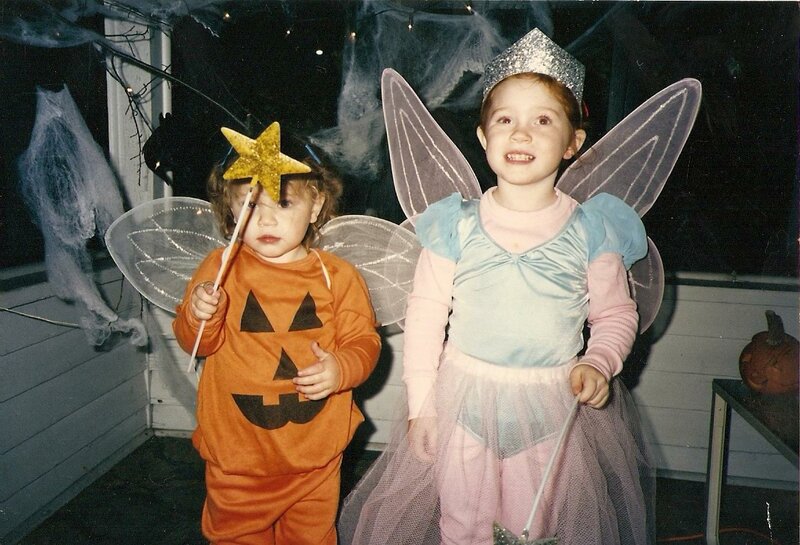 My mom made my costume using a shiny leotard we already owned (and that my sister & I fought over during dress up for years to come), a tutu skirt, and purchased tiara and wings. My sister was a pumpkin but when she saw my wings became insanely jealous and our family compromised by making her a fairy pumpkin. Several years later – one of two of my Maid Marion outfits (back-to-back years – one of them being the Maid Marion from the Disney cartoon movie with a pointy-eared hat). You are missing my wonderful princess hat that my mom did make me out of a stiff fabric you could iron together (it was fancy). (Note that my sister is not “an Indian” but Sacajawea because “she was pretty awesome”). The primary costume piece (my dress) of my Maid Marion get-up was from a garage sale or second-hand store and our dress up basket. The dress would be re purposed several years later when my sister went as Jo March from Little Women and my mom ironed on a “scorch mark” to the back with a translucent black cloth. 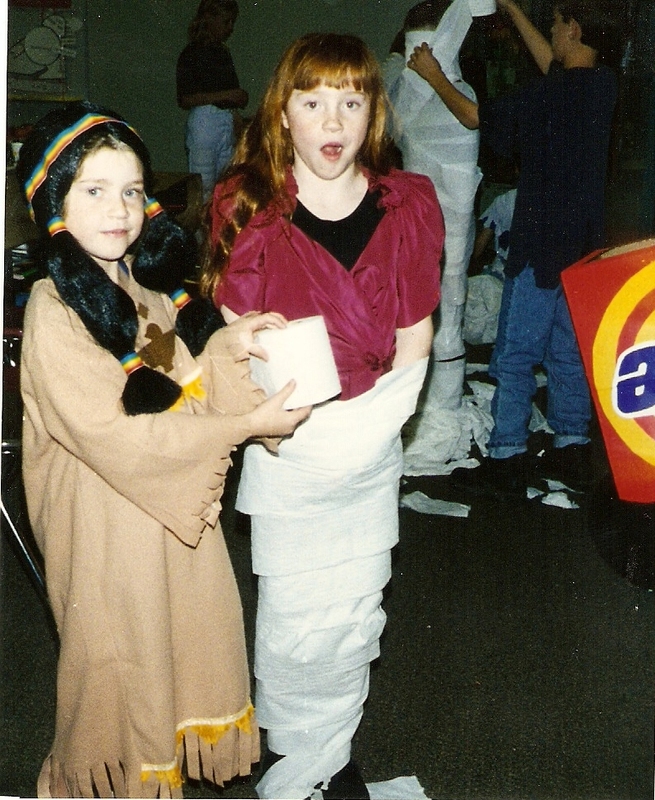 Part of the reason these homemade or thrifted Halloween costumes were the best is that we used them (or pieces of them) all year round playing dress-up or in school plays. The purchased mermaid outfit languished in the bottom of the dress up chest while these pieces were fought over and cherished. Plus its fun to help imagine what your costume will look like with your mom. Did you buy your costume or make it? What was your favorite Halloween costume ever?